1. What is this Sacrament called? The word EUCHARIST comes from the Greek noun εὐχαριστία (eucharistia), meaning thanksgiving. In the New Testament of the Bible we find Jesus establishing the Eucharist. At Holy Mass (Church Service) Catholics receive Jesus under the appearance of bread from the Priest; this is the Body and Blood of Christ. 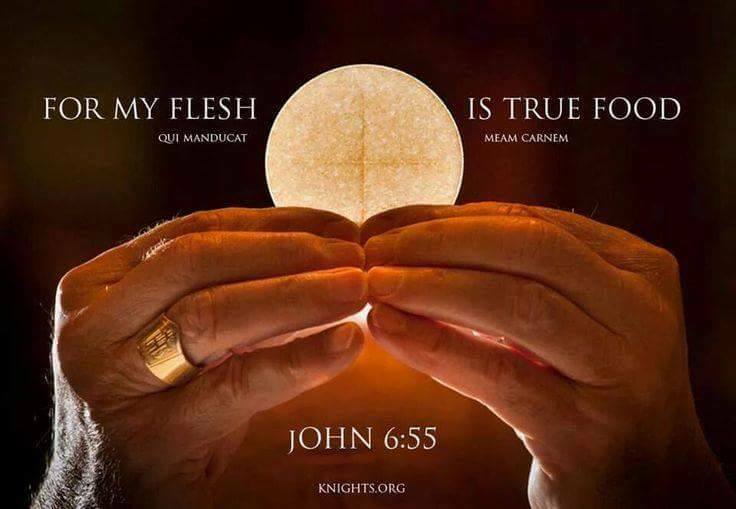 We believe that this transubstantiation happens because Jesus expained it in the Bible. CCC 1328 The inexhaustible richness of this sacrament is expressed in the different names we give it. Each name evokes certain aspects of it. It is called: Eucharist, because it is an action of thanksgiving to God. The Greek words eucharistein and eulogein recall the Jewish blessings that proclaim - especially during a meal - God's works: creation, redemption, and sanctification. CCC1330 We speak of the Most Blessed Sacrament because it is the Sacrament of sacraments. The Eucharistic species reserved in the tabernacle are designated by this same name. 2. Why is it called the Lord's Supper? CCC1329 The Lord's Supper, because of its connection with the supper which the Lord took with his disciples on the eve of his Passion and because it anticipates the wedding feast of the Lamb in the heavenly Jerusalem.The Breaking of Bread, because Jesus used this rite, part of a Jewish meat when as master of the table he blessed and distributed the bread,above all at the Last Supper.It is by this action that his disciples will recognize him after his Resurrection,and it is this expression that the first Christians will use to designate their Eucharistic assemblies;by doing so they signified that all who eat the one broken bread, Christ, enter into communion with him and form but one body in him. 3. Why is it called Holy Communion? CCC 1331 Holy Communion, because by this sacrament we unite ourselves to Christ, who makes us sharers in his Body and Blood to form a single body.We also call it: the holy things (ta hagia; sancta)- the first meaning of the phrase "communion of saints" in the Apostles' Creed - the bread of angels, bread from heaven, medicine of immortality,viaticum. . . .
4.What is the Breaking of Bread? 5. Why is it called the Holy Mass? The Eucharist is also called "Holy Sacrifice of the Mass", where the term "Mass" might be derived from the use of unleavened bread (in Hebrew: matzah). Latin word missa (dismissal), is used at the end of Mass in Latin: Ite, missa est ("Go; it is the dismissal"). "Misa" came to mean a 'mission', since the congregation are sent out to serve Christ. CCC 1332 Holy Mass (Missa), because the liturgy in which the mystery of salvation is accomplished concludes with the sending forth (missio) of the faithful, so that they may fulfill God's will in their daily lives.